Fine, I'll admit it, the logic behind this post's title may not add up. Regardless, Drew Brees, the New Orleans Saints' quarterback, lead the team in today's Super Bowl XLIV win and did it while maintaining a gluten free diet. He is also allergic to dairy, eggs, and nuts. 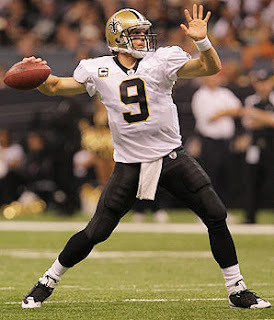 Brees was also selected as MVP of tonight's game! Amazing the things you can do without gluten, right? Thanks to Hilary for the heads up.